“I think immigration is part of the path forward for us,” Scott said. “In Vermont, [immigration] would be extremely helpful for our economy, and this pushes us in the wrong direction … I made a commitment to protect all Vermonters, and I believe we have a moral obligation to do so,” Scott continued. Burlington and other cities in Vermont are weighing whether to provide sanctuary to undocumented immigrants. Trump’s executive order bars so-called sanctuary cities from receiving federal funds. About a third of Vermont’s budget is federally funded. If the state were to become a sanctuary for immigrants and refused to comply with national enforcement actions requiring the deportation of undocumented immigrants, the Trump administration could block or reduce funding to Vermont. It’s unclear whether the order would apply only to funding relevant to federal immigration efforts or would be extended to other federally funded state programs. 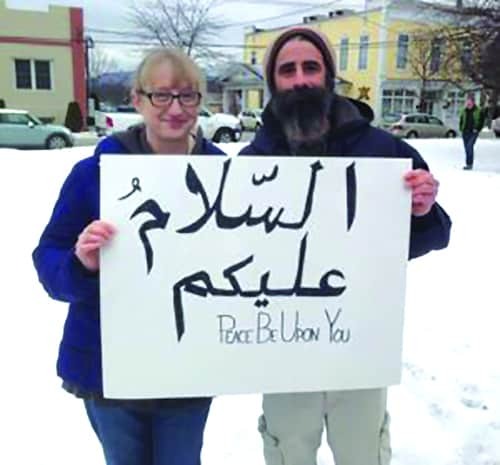 Supporters of refugee resettlement display a sign during a rally Saturday, Jan. 28, in Rutland.